First thing this morning the 3 got penned. Well, today was the day. We took the last 3 sheep up to our favorite butcher this afternoon. This is always something that needs to be planned for carefully, and since John’s hand surgery, we needed an extra special plan for the loading of the sheep into John’s truck. His Ford F-350 1997 diesel rides very high off the ground. 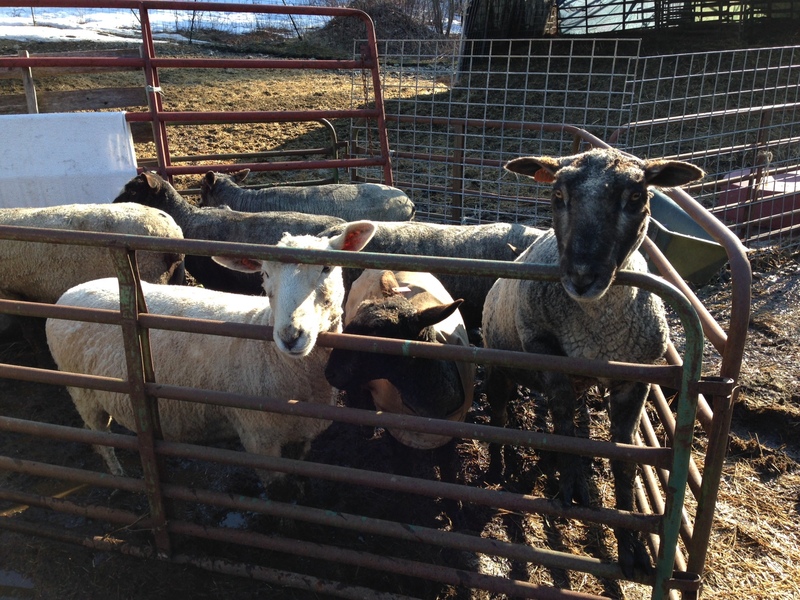 With my bursitis hip issues, I can no longer get into the truck without stepping onto a bucket or a milk crate anymore, so that should indicate how high we have to lift the sheep to get them into the bed of the truck! We definitely needed reinforcements, and our friend Jim Child of Hatchtown Farm came to help, as well as our teenage grandson and his mom. We don’t have a livestock trailer anymore, so John and I opted to build a “crate” out of galvanized metal panels in the back of his pickup. We made a teepee-type structure, and then John used a tie-down strap over the top for extra safety. 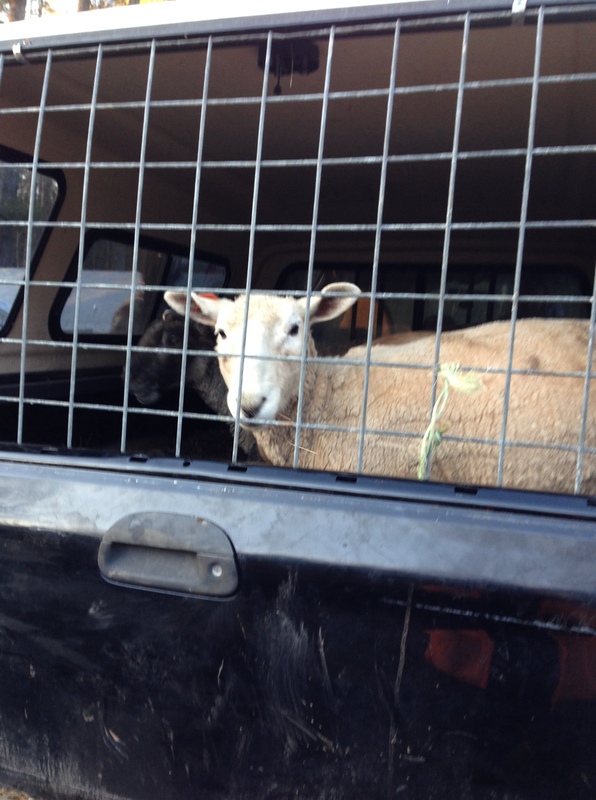 Luckily, we had the manpower, and as all the ewes were haltered, we really got through the loading in record time. The men had to lift the front end of the ewes up and over the tailgate, and I am still ok to lift the hind end in, thank goodness! And so we got them settled and took the 40 mile ride. Phew! All went well. The day began cold and bright, and is ending a little warmer and with a few clouds here and there. In between, we got a torrent of rolling giant-flaked snow followed by a little bit of rain, but we were already finished with the shearing and safely inside, gorging on a great potluck spread. Everyone who came did a lot of work, and before we got the meal going, Pam of Hatchtown Farm made an extremely lovely toast with some yummy Prosecco to our last shearing day. I am sore and achy, but we got a lot done in a very short amount of time. 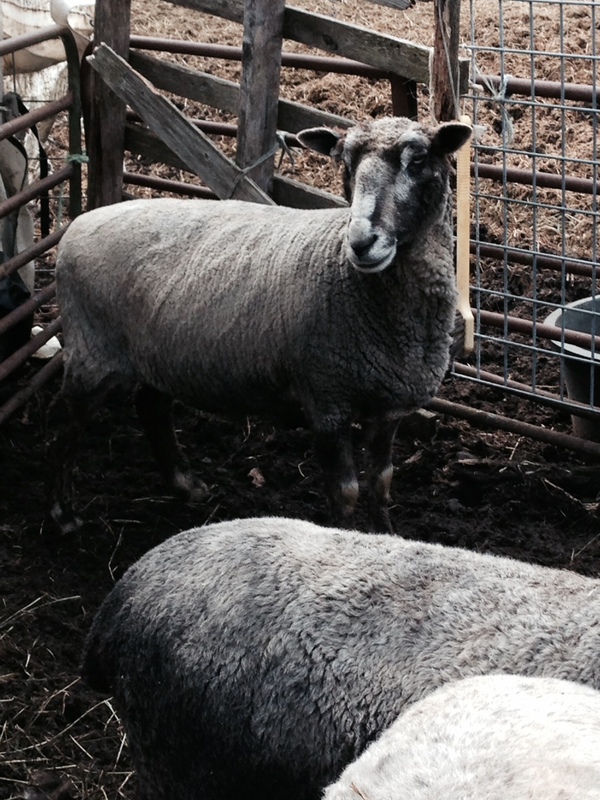 Emily the shearer did a wonderful job as always, and we have 7 more beautiful fleeces to process or sell. I do not think I will ever run out of fleece! 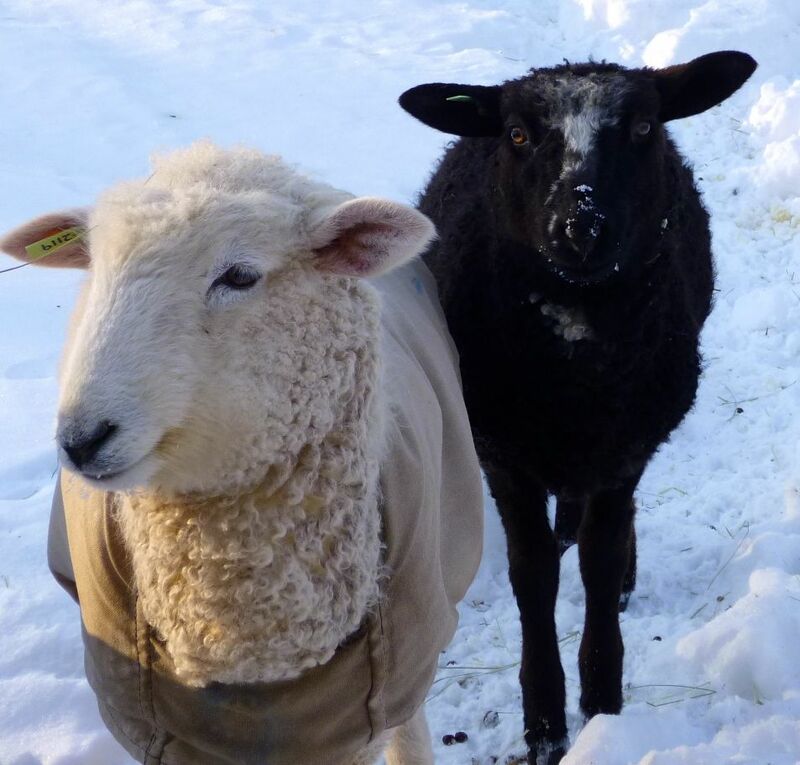 The only issue we had today was weather-related: Fern’s fleece (the big white ewe) was damp all the way through, a reminder of the downpours the other day. So the lovely ladies tagged the fleece and I already have it inside, spread out on the floor to dry. As the temperatures are due to go down in the next couple of days (down into the single digits tomorrow night, ouch), the heat in our floor should take good care of that. 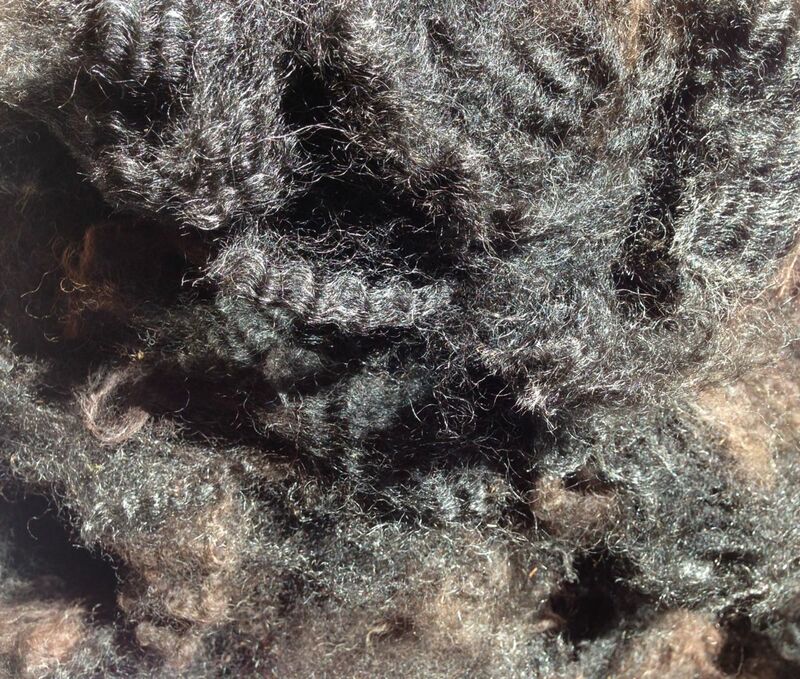 But as I sit here and look at these beautiful, lustrous locks (6″ average), I may just have to wash some up and do some spinning tomorrow! It was a balmy 6F this morning when I went out to feed the hungry crowd (and it got up into the high 20s by this afternoon). It really did feel warm compared to the past few days, and it was good to get the girls fed out of the greenhouse. 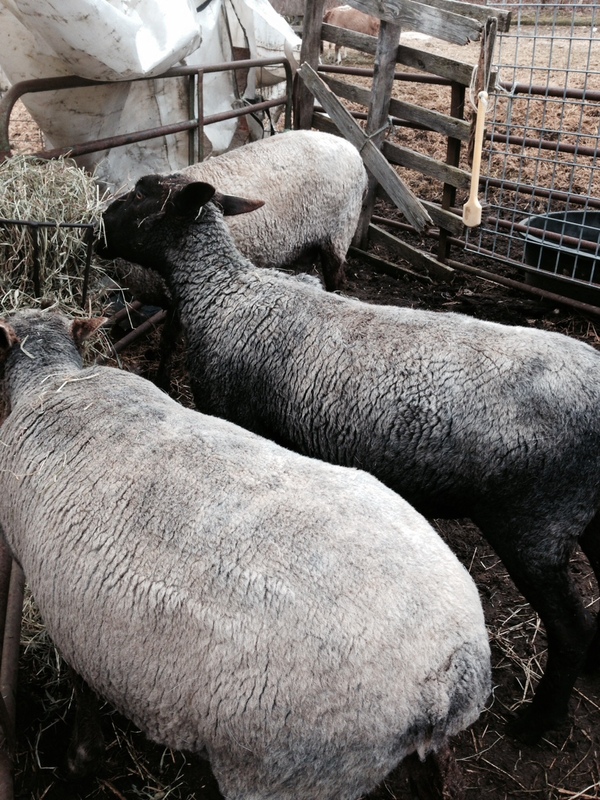 They have been cooped up and crunched in together, which the ewes do not normally tolerate. 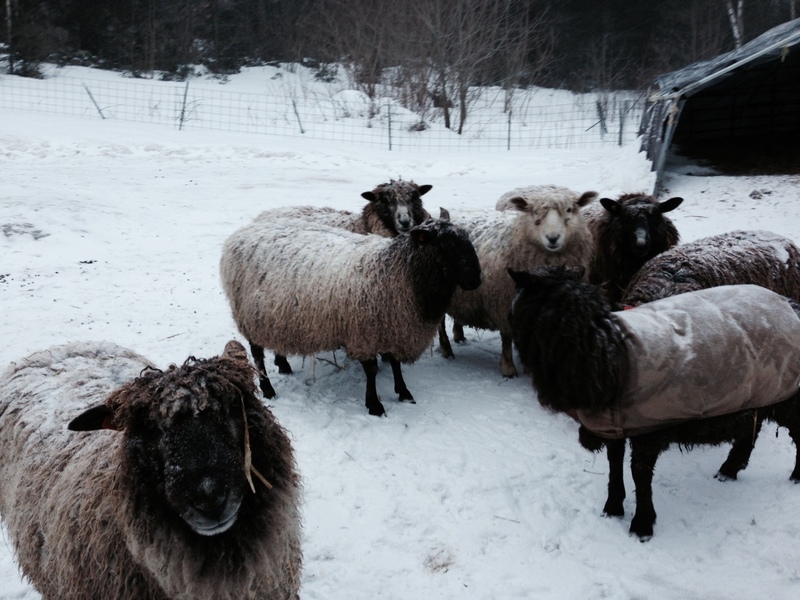 If the wind and the temperatures had not been so extreme, the ewes would not have taken shelter inside. And I have been very grateful that they have been. I hate to worry about pneumonia in the flock. This morning everyone was out and about. 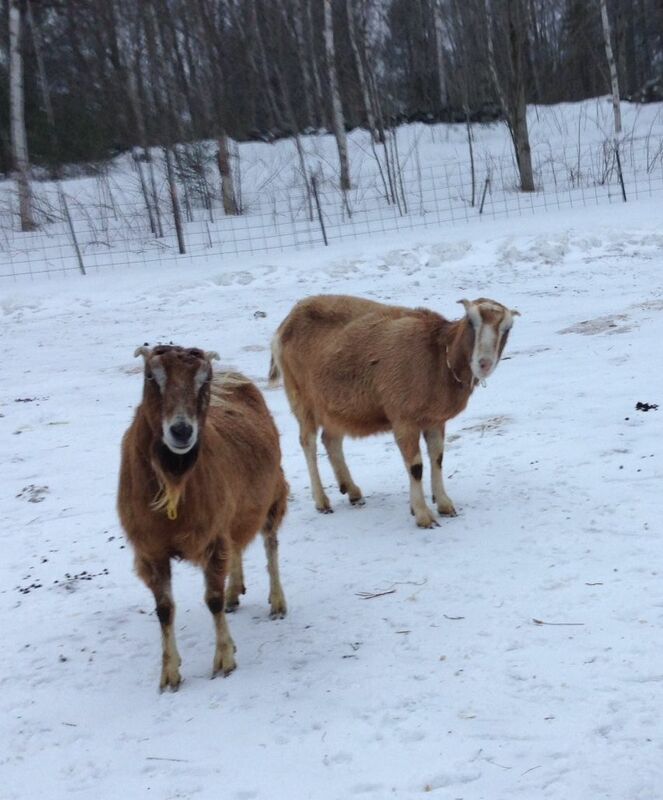 Even after all the hay was out on the clean snow, 3 of the girls were having none of it. They were very concerned about re-negotiating who is the queen of the paddock (they can worry about this all they want, the goats are really the ones in control!). Esther and HoneyBea were the two biggest contenders, and Fern, the one and only white sheep, kept putting her two cents in as well. There was shoving from behind, and head butting galore. Every time they separated there was a lot of pawing at the ground to indicate their displeasure with the outcome of their negotiations! By the time I stopped taking video, they all just shrugged and found some hay and gave it up. This afternoon everyone was fine, all were lined up as usual at the feeder for grain, and each ewe and doe found their place at the flakes of hay like clockwork. You just never know. 7 ewes and 4 does in the paddock have their issues from time to time! Tomorrow brings us 40 degree temperatures with heavy rain, and then by tomorrow night we are supposedly going into the deep freeze. Hopefully the YakTrax on my boots will keep my upright. Fingers crossed :*) I can hardly wait. Well, we got back to work for a half day yesterday. The snow was coming hard and fast from before we even got to school, and we got a legal half day in! Today, thankfully, we had a snow day. I would not have been able to get out of the driveway even with a delay. It’s been quite the weather show. The real problem comes with the temperatures. We never got above zero degrees today. It was -18 when I got up this morning, and by the time I did chores it was -14 with high, gusting winds. Always fun! I fed everyone inside as best as I could, but the ewes and the does need to have some space, or there is fighting over hay. Everyone is ok. 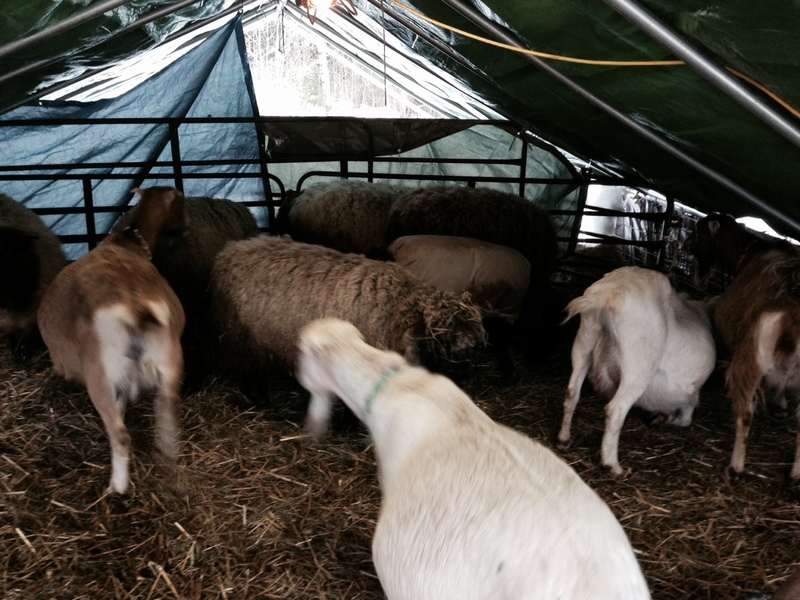 They have water (thank goodness for the tank heater) and enough shelter to keep the wind away. The two boys are hunkered in with Zorro the fuzzy llama, and they seem to be fine. We are feeding out more hay than usual, in the hopes that they will keep their calorie intake up and make more body heat. This has been such an unusual winter so far, I do not even know what to say. Except that we are all still here and doing okay! 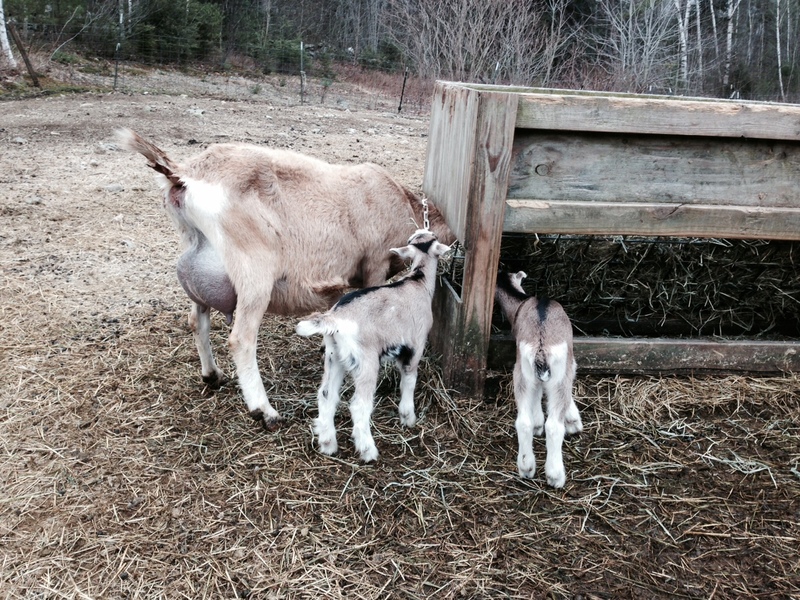 This afternoon when I got home I let all the moms and babies out of their jugs. It was time. It also is not raining, and tomorrow looks like a cloudy but dry day, so it will be a good time to let everyone get used to the mashup of babies, mamas and others. There was a lot of lambie crying, dancing, bouncing and back flipping going on, so I know the little ones were ready for some freedom. And this morning our first lambie boy, Bertie, was doing flips in the greenhouse when he finally discovered that there are other little critters just like him! He would not even listen to his mama calling him from outside. He just jumped and cavorted in the greenhouse for the whole time that I was feeding everyone this morning. So now he has a cohort, and he was thrilled to pieces this afternoon. Hopefully they settle in and navigate the paddock well!